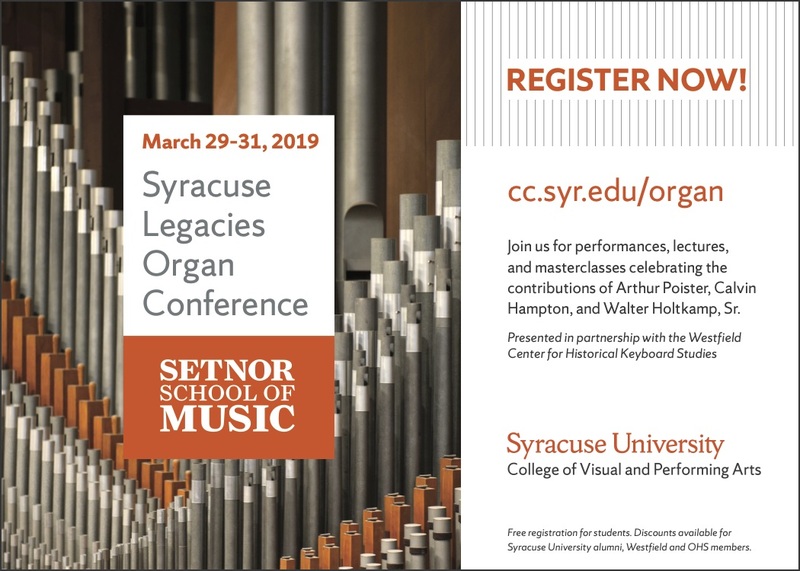 Syracuse University will host a very special event, the Syracuse Legacies Organ Conference, March 29—31, 2019. The conference aims to honor the contributions of three important figures with ties to Syracuse University: Arthur Poister, Walter Holtkamp, Sr., and Calvin Hampton, with public performances, masterclasses, and lectures. You are warmly invited to take part in this event, either by registering for the symposia and meals, attending the free public concerts, or a combination thereof. Organ Historical Society members receive a discount on the conference registration fee. For more information, visit us on Facebook, Instagram, and our conference website.